Once upon a time, there was a young girl. She was 9 years old and her name was Wende. Wende was incredibly intelligent, yet she had a hard time learning things by heart. No matter how hard she tried, she just could not memorize the planets of the solar system. It just did not stick in her head. One day her teacher told her a story about all the planets. A story about how the sun was lonely and Mercury was his first friend. How Mercury fell madly in love with Venus and how Planet Earth got jealous. After telling her the story, Wende was able to remember all of the planets in the right order. Why? Because of the magic of storytelling. Wende could remember the story and with that, she could remember the planets. 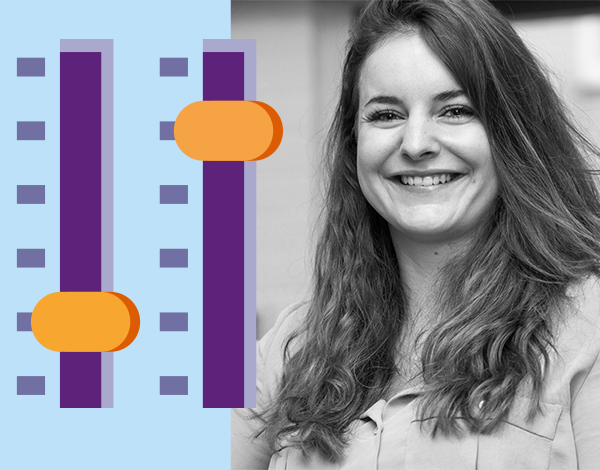 In this blogpost, I will tell you what storytelling is and why it is an important tool to use in the texts on your website. This post will be the first of a series of blog posts about storytelling. The word storytelling pretty much speaks for itself. Storytelling is about telling stories. It is about using stories to engage your audience, or to make something more clear. Photos, pictures and film of course really help to tell a good story too. Stories have always been a way to communicate. Before people learnt how to write, they would tell each other stories. Stories are much easier to remember than simple facts. That’s why Wende from the story remembered the planets. Also, stories are enjoyable, they stimulate your imagination. That’s why parents tell their children stories. That’s why we like to see movies and read books. People love stories, people are addicted to stories. In 2017 I visited a conference and I saw David JP Phillips on stage. He talked about the magical science of storytelling. I was blown away. His tolk was such an inspiration for me. Two weeks later, I had to speak at a WordCamp and I was so very inspired by David’s talk, that I did some storytelling of my own. Next to using storytelling in presentations, you can use it in writing. Lots of travelblogs, personal blogs or momblogs use storytelling throughout all of their posts. Geraldine de Ruyter has a really funny blog about travel and many other things. Every post is a little story on her blog. But even informational blogs could use storytelling by adding an anekdote or an example. In my post about site structure and why it is important I used the exact same story as in my presentation at the WordCamp. Using storytelling in your blog post will – if you do it the right way – make your post a more engaging one. Your blog post will become something people want to read. Stories increase the attention of your audience. If you use stories the right way, stories will help you to make your message more clear. Stories can help you to provide proof for your argumentation. They can add clarity. 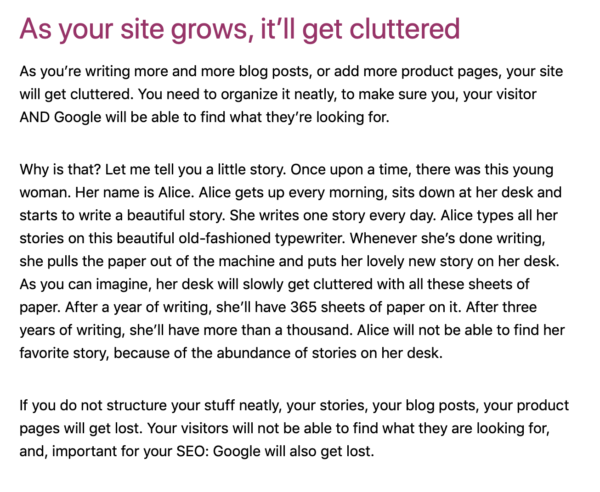 My story about Alice (screenshot above) is written in order to help people understand the importance of a clean site structure. This is a rather difficult subject to grasp. A story adds clarity. Most importantly, people will remember your story, and with that, they’ll remember the message of your post or even your brand. If you use stories in a good way, you could even inspire people to take action. Maybe you’ll inspire people to clean up their website or to get started with storytelling in their blog posts and presentations. If you Google ‘storytelling’ you’ll see amazing things. Lots of online storytelling is about brand storytelling. Perhaps I’ll write a blogpost about that in the future. For this series, I’ll be focussing on using storytelling in your writing. And, I will also focus on the topic of storytelling and SEO. In the next post in this series about storytelling, I want to focus on how to use storytelling in a blogpost. I want to start off by discussing the elements that are necessary for a good story. Also, I will share some practical tips and examples of how to start using storytelling in your blogposts. If you have nice examples of your own use of storytelling, I would love to see those! Maybe I can even share a few of your examples in one of my next posts! The post What is storytelling and why should you use it? appeared first on Yoast. Of course, we tested this new version extensively. But before we push this change to millions of Yoast SEO users, we like to see how it works with your content. 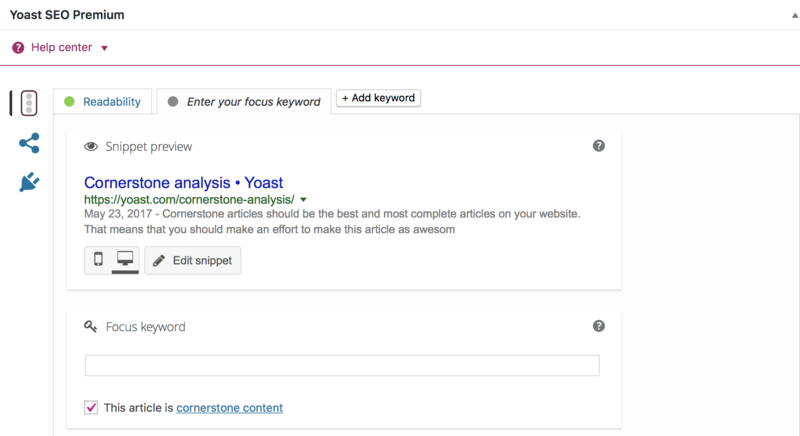 Your feedback will help us fine-tune the analysis before we release Yoast SEO 10.0. Make sure that you are updated to Yoast SEO 9.4 in order to try the beta! 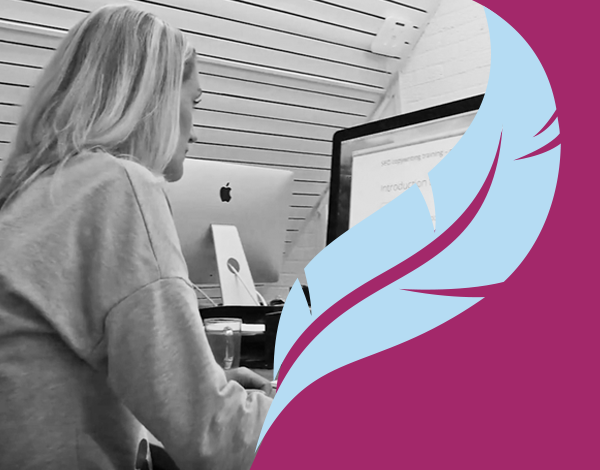 The post Why you should try out the new Yoast SEO analysis appeared first on Yoast. Optimizing your site structure should be an important aspect of your SEO strategy. Structuring your site is of crucial importance for your SEO. But how does one improve a site’s structure? Where do you start and how do you keep an eye on the structure of your site if your site is growing? 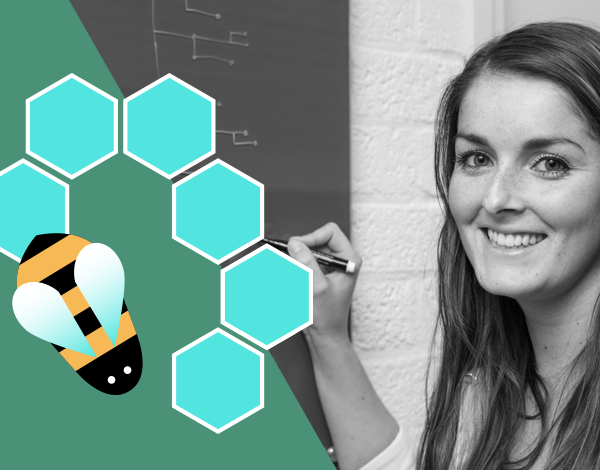 In this post, I’ll teach you to improve your site’s structure in 4 simple steps. We spent the past year thinking about how to translate the advice we give on improving your site’s structure into useful features for our plugin. This resulted in three new features (and we’re already thinking about new ones). The first feature we released was the internal linking feature. The internal linking tool helps you to figure out which articles you should be linking to. 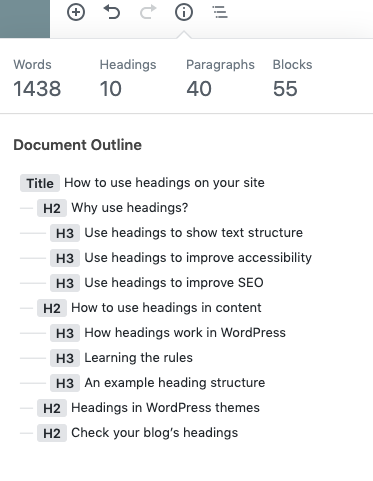 Our second feature on site structure, the cornerstone content analysis, will help you write awesome cornerstone content articles and get those articles in a central position in your linking structure. And the third feature, the text link counter allows you to check which articles need more internal links. Combined, these three site structure features are a powerful toolset for improving your site structure. Your cornerstone content consists of the most important articles on your site. The ones you want people to read. The ones you want to rank with in Google. For all cornerstones, you should check the box in the snippet preview meta box. Once you’ve checked that box, your content will be assessed more strictly by our readability analysis. You may wonder why we’re being so fussy about cornerstone content. The answer to that question is this: for cornerstone articles you should raise the bar, because they’re very important! They should be better than your other articles and therefore, demand more of your writing skills. Our cornerstone analysis will help you to raise your standards (and stick to them). It will be harder to score that green bullet. You have to do all important things right! Step 2: Link to those cornerstones! The second step to improving your site’s structure is to ensure that blogposts surrounding a certain topic all link to your most important article about that topic. Use the text link counter to see whether your cornerstones have enough links. In your post-overview, you can select your cornerstone articles. In our example, the Ultimate guide to small business SEO has fewer links than our other two ultimate guides. 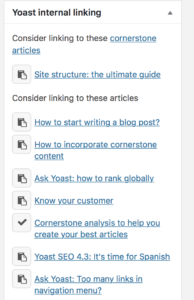 You should open the cornerstone post with few links and check the Yoast internal linking feature. The articles our internal linking tool suggests are great suggestions to link from to your cornerstones. You should go to these articles one by one and add links to your cornerstones (that’s a bit of work!). If you aren’t using Yoast SEO premium (and do not have access to our internal linking feature), use your internal search function and search for the keyword of your cornerstone article. The post that’ll come up in this search query should be linking to your cornerstones. Once you’ve improved your cornerstone articles and made sure you’ve added links from all of your posts to those cornerstones, it’s time to make sure that there are no orphaned articles on your site. Orphaned articles are posts or pages that hardly any other posts link to. They are hard to find on your site, both by your audience and by Google. In order to identify orphaned articles, you can use our text link counter. Sort the posts by the number of internal links linking to the post. Posts with fewest links will appear at the top of the list. Open these posts and (again, if you use Yoast SEO Premium) check the suggestions of the internal linking tool. Using the tool, you can make a list of posts that should be linking to your orphaned posts. After that, you can open those similar posts and add links to your orphaned posts. You can also use the search function to find posts to link to your orphaned article. Step 4: Improve those dead ends! Every post should have suggestions for further reading. After all, you want people to stay on your website. Suggestions should always be on topic. People reading about ballet shoes are probably interested in ballet shoes. So, offer them more reading material on ballet or on ballet shoes, but don’t bore them with karate. Open your post overview and sort your posts by the number of internal links in the post, using our text link counter. Open the posts with fewest internal links. Add links to similar posts using our internal linking tool, in the same way as described above. It’s so easy and it will increase the time people spend on your site considerably. Agreed, it is a bit of work. But if you set to mind to it, follow these 4 steps and use the Yoast SEO site structure features, you’ll be able to improve your site’s structure significantly. And that is most definitely going to result in longer visits by your readers and in higher rankings in Google. In the 5.0 release of Yoast SEO we’ve added the Yoast SEO text link counter. This new functionality counts the number of internal links in a post and the number of internal links to a post. It sounds really simple, but it’s extremely useful and actionable. It’ll really make it so much easier to improve the structure of your site. Why is that? Why is site structure even an issue? And why is our new text link counter useful? Here, I’ll explain all about that. The text link counter counts the internal text links in your posts. It consists of two counters: The first counter counts the number of links in your post and the second counter counts number of links to your post. The structure of a site is a very important aspect of SEO. After all, Google follows links. The result of Google following links is that the internal linking structure of your site determines how Google crawls your site. Posts and pages that are linked to more often, are crawled more frequently than post and pages with few (internal) links. Same goes for visitors: pages and posts that have many links referring to them, get more visitors. If you forget to link to a specific blog post, nobody (Google included) will find it. The post How to use headings on your site appeared first on Yoast.